Remember! Remember! The fifth fourth of November. After a warming cup of coffee in the car we set out for a memorable walk along Balephetrish Bay on the northern coast of the Island. The late autumn sunshine cast a warm glow over the vista before our eyes. Coming down on to the sand the first thing to catch our attention was the oyster catchers, to be quickly followed by a lone seagull on sentry duty. We are only in pre-school when it comes to identifying birds, but we think there was also several flocks of sanderlings. It was so exciting to look out into the waters of the bay and see the faces of several seals. As usual click on one of the photographs to have a slideshow of larger photographs. As we retraced our steps back towards the car, we looked back on a dramatic sunset. No wonder the cows on the machair reflected the warm glow of the sunset. 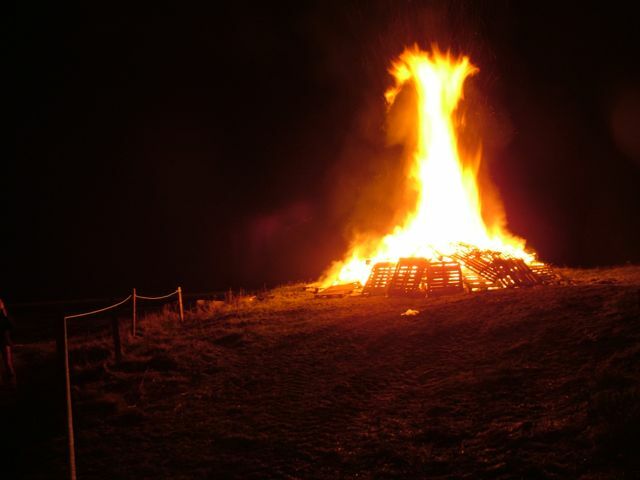 This fifth fourth of November was rounded off with a community bonfire and firework display at Crossapol beach. For those who wanted it, there was soup, burgers, bangers, and of course in true Tiree style – cake. And it was all free. We understand Tilley footed the bill. It was very kind of her. If you visit Tiree you are sure to meet her. She can’t be missed.